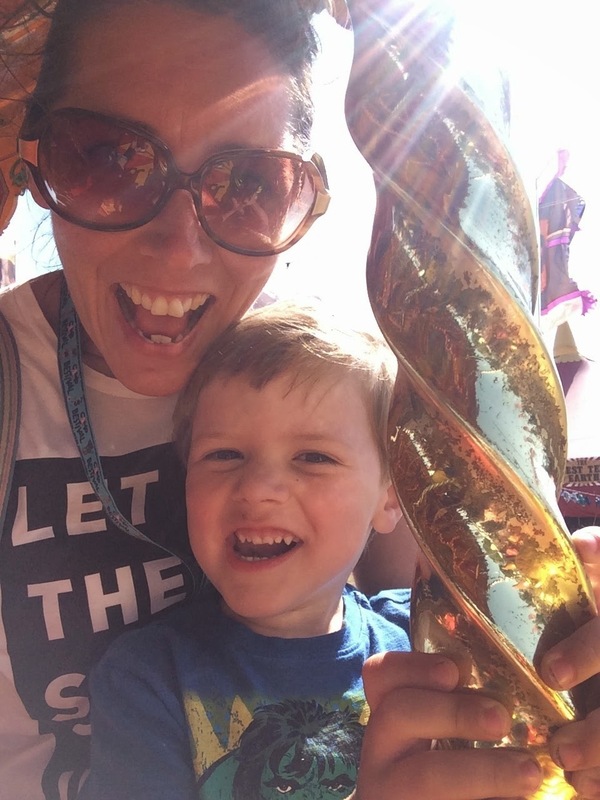 I ♥ Motherhood: Camp Bestival - Our Highlights! 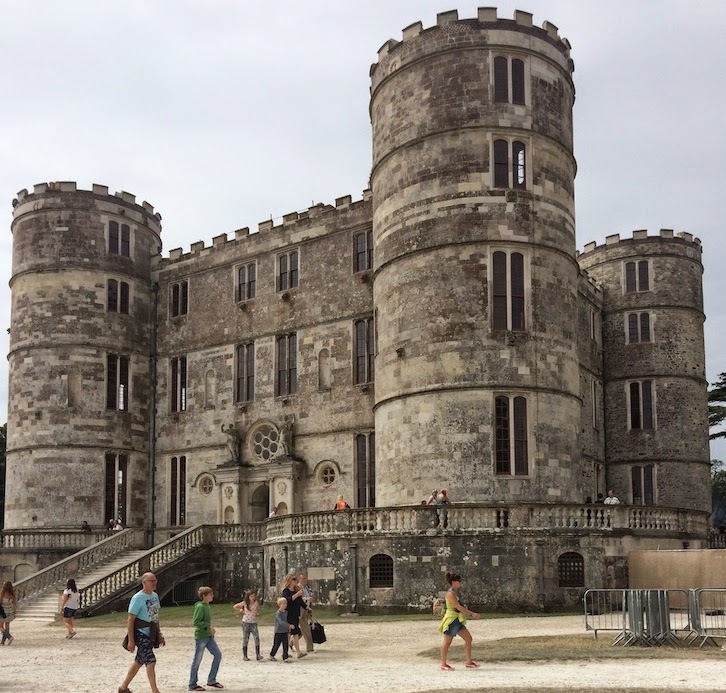 Camp Bestival - Our Highlights! As soon as we got on site on the first day we were drawn towards the birds of prey brought to CB by Haven Falconry. 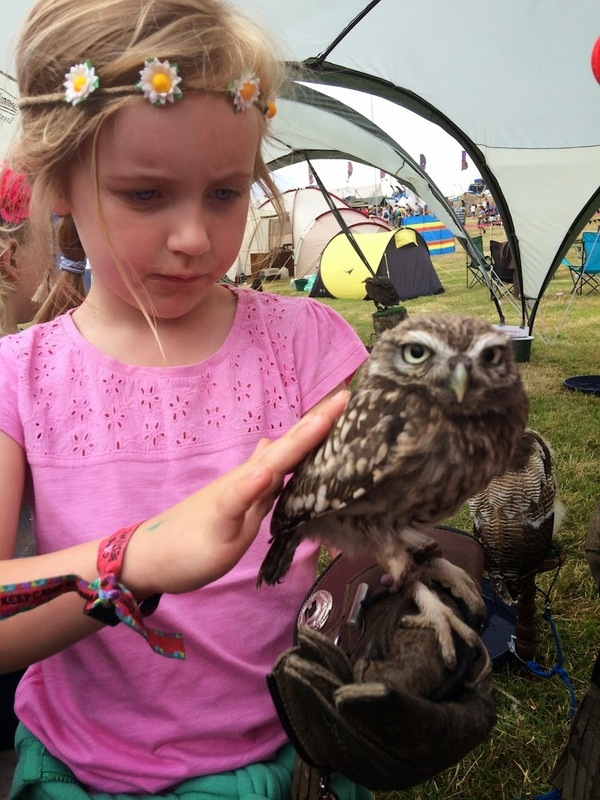 Isla was desperate to handle one, so I donated £3 and she got to hold a Little Owl. It was gorgeous. I'm a big owl fan and I would have liked to have gone back and seen one of the the daily displays that they held. Isla had a good look around the outside of the entire castle every day that we went on to the festival site - she loved looking through all the windows, pointing things out that she could see and making up her own little stories about who lived there. It really is a stunning building. Kids have a knack of making friends instantly. They are best friends for the weekend and there's no sadness that they won't see each other ever again at my kids age, they accept it was temporary and move on. I loved seeing them engage with other children. The other thing I was so happy about was seeing Isla become so brave and want to join in with everything. She was first to put her hand up to participate and she had no fear. I loved that. Near to the castle were some charitable organisations and we spent a really long time at the Save the Children tent where Isla made a loom band (aargh!) and had some glitter tattoos done, Noah also had one. The team at Save the Children were lovely and we had a brief conversation about Gaza as I'd signed the petition a couple of days previous. There is a real charity presence at Camp Bestival which makes it feel less commercial. Now, The Flying Seagulls were a real highlight of our Friday at Camp Bestival. They were brilliant. Isla was totally captivated by them from the minute the juggling show started with Billy Bang leading the team of performers in a very funny show. She sat amongst all the other children giggling and following all the instructions that Billy gave out. And when it came to audience participation she was first with her hand up and desperate to stand at the front and try to juggle. It was so lovely to see my girl showing the extrovert in her and I know she is braver than I was at her age. Noah was also quite taken with the Flying Seagulls but he chose to take more of a backseat sitting on my lap to observe what was going on. We must have been part of it for at least an hour and then they came round for donations to the causes they support. They work mainly in Romania, Albania and UK and their aim is to make arts accessible for all including those with disabilities and children in hospital. Another place where we spent a lot of time. There were opportunities for the kids to show off their talents (we narrowly escaped Isla getting picked to sing 'Let It Go'! ), theatre shows that involved the kids from the Treehouse Theatre Company - (personal favourite moment was when they asked a tent full of kids how should someone die in the next part of the play and a kid shouts in a pool of acid!?! Nice.). This is also where Isla tried out the trapeze. I could have burst with pride over the weekend with everything she had a go at. There were so many opportunities to make things and Isla loves crafting. So we made a brilliant pom pom using strips of mesh fabric, a flower headdress (my favourite make) and an elephant. 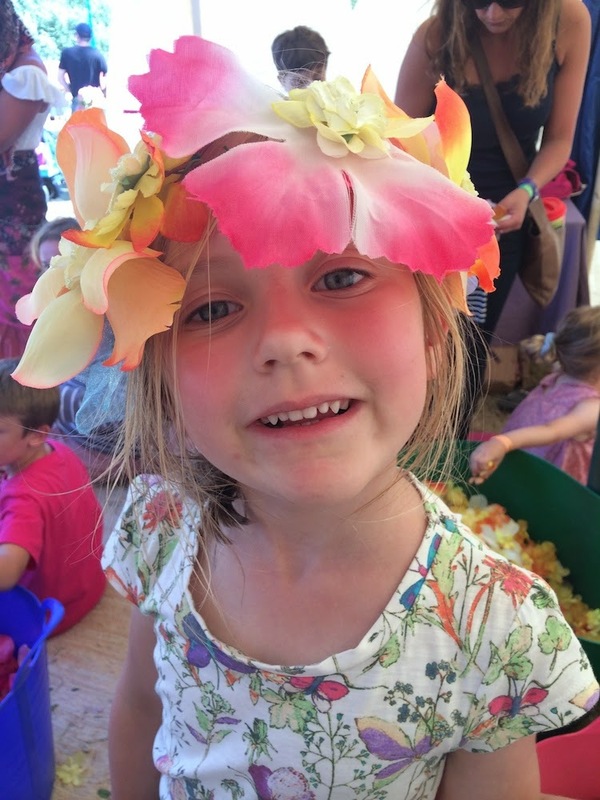 The flower headdress was the only thing that cost money - £3 but it looked gorgeous and was worth that for keeping Isla occupied. We ate some delicious food while we were there, some really tasty burgers and pulled pork but my most favourite lunch were the naan wraps from Rola Wala. They were absolutely scrumptious and I'd love to know where we can taste those again! These both needed to be paid for but it was so cool to see Isla go off on her own up such a high structure. 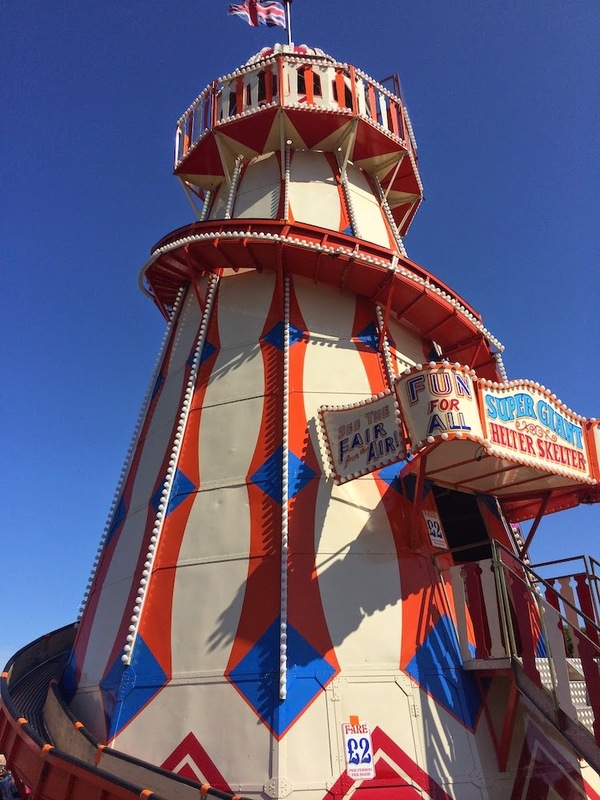 The Helter Skelter is something that she previously would have refused to try or insist I come on with her and I have to be honest seeing how big it was I did nearly say we had to do it together but parenting is as much about letting go so I encouraged her and she loved every second! Noah thought the merry go round was amazing fun too and we rode that together saying Giddy Up all the way round. Some fabulous folk music to be heard here. We sat and enjoyed a cup of Yorkshire tea and listened to the music while Noah slept in the trolley. We particularly enjoyed The Jimmy Hillbillies and we ended up seeing them again when we went into The Travelling Barn Tavern where Isla struck up a 10 minute friendship with a little girl and I couldn't help but smile watching them as they danced and span each other round. This was so cool, a travelling 'insect circus', all capable of amazing physical feats! Amongst them jugglers, trapeze artists and tight rope walkers. Isla and Noah were both captivated. Final things that we loved about Camp Bestival were all the impromptu stuff you would just come across. Random pianos to play, hula hooping competitions, brass bands. Ice creams every day were a must to celebrate the blue skies. Things I'm sad we missed are: Dingly Dell - we're big fans of being outdoors and the National Trust so it's a shame that we didn't make it there. The Wall of Death! Really wish we'd seen that, definitely on my list for next year. I'd also like to have spent more time in the Bollywood tent and in the Caravanserai Bar - particularly sitting in one of those Waltzer cars having a drink. So as you can see there are just too many highlights to Camp Bestival and we will DEFINITELY be going again! We paid for our tickets to Camp Bestival. 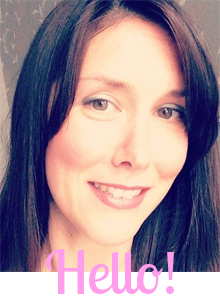 This post is purely driven by a need to share our experience with you. 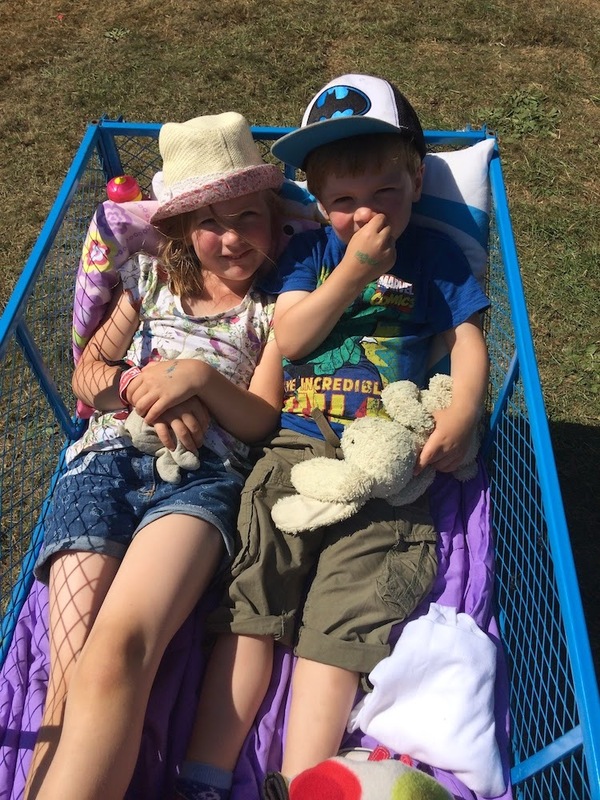 Camp Bestival - A Family First!